Never forget our fallen heroes! Is a 2nd American Revolution on horizon? It very well could be when you consider the damage done by President Barack Hussein Obama in the last 18 months. Tremendous damage could still be done even if the House and Senate control is regained by Republicans this November. He and the EPA may try to impose by “regulatory” fiats many parts of the cap-and-trade and other climate legislation that failed in the Congress. And by executive orders and the in terrorem effect of an industrywide “boot on the neck” policy, he can continue to diminish energy production in the United States. By the trick of letting current-law tax rates “expire,” he can impose a $3.5 trillion 10-year tax increase that damages job-creating capital investment in an economy struggling to recover. And by failing to enforce the law and leaving America’s borders open, he can continue to repopulate America with unfortunate illegals whose skill and education levels are low and whose political attitudes are often not congenial to American-style democracy. American Patriots must do everything possible to assure that doesn’t happen in 2012. Now that the Obama administration and the Democratic Congress have propelled this great nation even farther down the road to socialism it’s time to take steps necessary to take back our country. It’s time to step up to the plate and do whatever it takes to return the USA to its roots. And it’s time to do this PEACEFULLY. Robert Moon has a great piece on how to do this. 1) Vote them out in 2010. This option requires much patience and will not actually mean anything unless those elected actually reverse all the spending, bailouts and takeovers. Most likely, Democrats will be punished for a few years while Republicans ride the tidal wave of public outrage into office, at which point they will throw us some symbolic scraps from the table, rather than making a serious commitment to uprooting federal tyranny. 2) Legal challenge in the courts. There is a chance that the Supreme Court could reverse parts of this law based on the “Commerce Clause” debate (a few states being bribed and blackmailed into submission at the expense of all the others). 3) Nullification. This is where states stand up for their 10th Amendment rights and declare that, since this law is blatantly unconstitutional, they refuse to acknowledge that it was even passed. And no, the Founders never intended for the federal government to be the sole determiner of the size and scope of its own power. State nullification was always intended as a natural check against federal encroachments. If the federal government defies a legitimate nullification action, which it will, then this could lead into a secessionist movement. And as I have noted, the majority of states have already introduced some form of sovereignty movement. 4) Civil (or un-civil) disobedience. For this not to backfire, it requires numbers, coordination and legitimacy in the eyes of the people. ObamaCare will offer many such opportunities (people being denied health care, punished for not buying insurance, etc.). Moon also reminds us of the question we all as AMERICANS need to be ask ourselves in the face of this full-frontal assault on the fabrics of this great nation. How far our we willing to go to defend OUR republic? Thomas Jefferson wrote in the Declaration of Independence that when government becomes adversarial to the interests of The People, it is both the right and the responsibility of The People to rise up and “alter or abolish” that government. The Founders revolted over taxation without representation, and after Virginia, New Jersey and Massachusetts…and all the polls, and Democrats still having to openly bribe and blackmail their own super-majority into voting for this treason, I would say we are pretty much there. It will be a long, hard road but as an army of Davids we can take it back. Excellent op-ed by Senator Jim DeMint (R-SC). There’s no fixing the government health care takeover Democrats forced through on Sunday. It must be repealed. After telling Americans in 2008 that they would lower spending, taxes and insurance premiums, Democrats passed a bill that breaks every promise. Using secret deals, kickbacks and carve-outs, Democratic leaders jammed through legislation to control more than one-sixth of the nation’s economy. The plan will explode the national debt, raise $569.2 billion in new taxes, force taxpayers to fund abortions, and impose unconstitutional mandates on every American. All of this was done in the face of overwhelming public outrage and bipartisan opposition in Congress. This process has been an insult to our democracy and threatens our nation’s prosperity and freedom. Government bureaucrats will now dictate the terms of our health care system. Americans must purchase Washington-formulated insurance plans or pay stiff penalties, a requirement that defies the Constitution and is a boon to the insurance companies the Democrats pretend to despise. 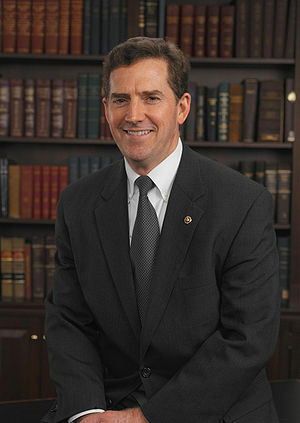 Kudos to Sen. DeMint for helping lead the fight against the HCR bill.